People who are alive to the likelihood of society collapsing in our lifetimes will not be alone for long. But for now, we are few and far between. Despite 200,000 people downloading my Deep Adaptation paper, in most professional circles this topic remains taboo, and certainly not a priority within strategies, budgets or meetings. This situation means people find it challenging to work on the professional implications of their concerns. Yet the longer we delay our exploration of what to do and how, the more likely it will be that organisations and societies respond poorly in future. There are many professional fields that are relevant to our predicament, including mainstream climate adaptation, disaster risk reduction, mental health, permaculture and so on. Because a society that breaks down will affect all walks of life – and so all of us can do something to help each other prepare, whether from within our current role or a new one. To extend the glide of our societies and soften the crash, the goal must be for every professional association, think tank, trade union, and research institute, to develop their own work on collapse-readiness. Before that happens, we can connect around the world and support each other to play a role in our professions and locations when the time arrives. It is for these reasons that today we launch the Deep Adaptation Forum. It is the next step for those of us who accept likely collapse to work together now and thereby mark the way for our colleagues to follow in time. Through this free forum you can join regular webinars, seek advice and co-create shared resources for your field of expertise. * and maintaining an event calendar. * or arguing that near-term human extinction is now inevitable. Such discussions occur in many other places, and instead, this Forum is solely dedicated to serving those who wish to explore collapse-readiness in all its potential forms, from the practical, to political, emotional and spiritual. We invite a diversity of opinion, including a diversity of political approaches, so long as these do not advocate forms of fascism or violent conflict. We also invite participants, if they wish, to employ the Deep Adaptation framework. That means exploring what the concepts of resilience, relinquishment, restoration and reconciliation could mean for our profession or interest. Therefore, it will be useful if you read the Deep Adaptation paper and blog on Reconciliation before participating in the Forum. There is no need to wait for your fellow professionals to wake up to our predicament. There is no need to spend much time justifying yourself. There is no need to rage against ignorance. Instead, we can start to live our truth together now. I look forward to connecting in the Forum. Professor Jem Bendell, Founder of the Deep Adaptation Forum. Note that the Forum is the place for professional collaboration. If you simply want to see the latest posts from professionals in this field, join our LinkedIn Group. If you have a general interest but don’t work on it, then join our Positive Deep Adaptation group on Facebook. In recent weeks I have noticed an upsurge in people discussing the calamitous state of our climate, its impacts and our response. My server crashed twice due to the download demands for my Deep Adaptation paper. To channel this interest into useful professional collaborations, next week we launch the Deep Adaptation Forum, as an international space for people to work together – ahead of their wider professions buying into this agenda properly (which is bound to happen, but we can’t delay). Already our LinkedIn group for professionals has circa 1500 members. Many people who are getting in touch or tweeting their thoughts are not professionally engaged, but are retired people, or busy with their existing jobs or families. So, we are today launching a Facebook group as a simple means of helping them connect. First, on emotional, psychological and spiritual implications. Second, on our knowledge of practical means to support wellbeing ahead of (and during) social breakdowns. Those practical means may be at household, community, national or international scales. Collective action in a spirit of compassion is particularly welcomed, rather than defensive prepping for conflict. The group wont be a place for sharing news or information on the state of our climate or environment. Nor will we share news and information on aspects of social breakdown. Why? Because as things get worse, our feeds will be swamped increasingly by such news, and in that context we can benefit from a group to support our positive deep adaptation to the situation, and not to crowd that out by news chronicling the changing climate or breakdown. By “positive” deep adaptation we do not mean that we will be inviting messages that say “we must have hope” or “we can’t say it’s too late” or “look at this latest wow tech that will mean someone else will fix everything”. Such fear-based attitudes that script stories of the world to help ourselves feel better, for now, are counter-productive. Instead, we will be sharing information and ideas on all kinds of things that start from the view that collapse is now likely or inevitable. What might that involve? Check it out here. Online, March 27th. Deep Adaptation Q&A Online with Prof Jem Bendell. Bring your questions for a moderated conversation with the originator of the Deep Adaptation framework. 9am to 10am GMT. March 27th. Limited places available. London, April 15th. Rebellion Day, Extinction Rebellion. Preston, UK. April 29th. Green Monday Anti-fracking protest. Brussels, May 13th. European Commission. With Dougald Hine and others. Details to be announced. Athens, Greece, June 6th. “Community Adaptation to Climate Breakdown” details to be announced. 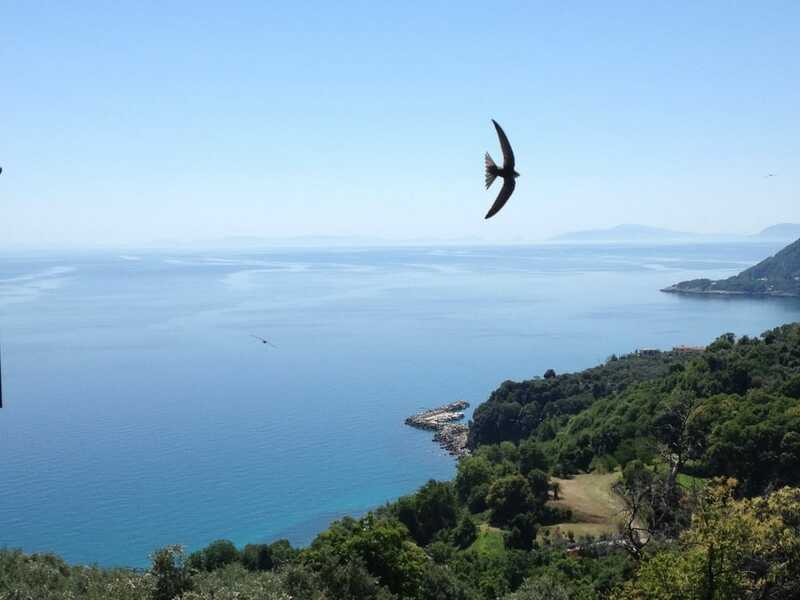 Kalikalos retreat centre, Greece June 22-29th. Inner resilience for tending a sacred unravelling. Lancaster UK, July 14th. “Lancaster Community Dialogue for Deep Adaptation” Using Open Space methods to explore implications and initiatives with communities in the North West of England. Free. 10am to 5pm. Register. Cumbria UK, July 18-21st. Certificate in Sustainable Leadership short course, including sessions on Deep Adaptation. Cumbria UK, September 18th. Deep Adaptation Public Lecture, Ambleside Campus. Time and registration link to be announced. Cumbria UK, September 24-27th. Deep Adaptation Retreat (with Katie Carr). Please sign up to my quarterly newsletter for more detailed information. If you would like Jem to appear in a meeting you are organising, then consider applying to the Deep Adaptation Forum to host a dialogue. Info here. The emerging realisation that climate change is becoming a destructive tragedy, not just an urgent challenge, is profoundly disorientating for many people. How are we to feel? What are we to do? What might become the purpose of our lives and work in the face of imminent societal breakdown from climate chaos? You are warmly invited to join us for a week of dialogue and reflection with people working on this Deep Adaptation agenda. We will focus on nourishing the inner resilience for us all to help make this a kinder and more sacred unravelling of life-as-we-know-it. We will draw upon the experiences of participants, a range of experiential exercises as well as facilitated connection and exploration that welcomes emotional, spiritual and somatic ways of being and (un)learning, as well as the cognitive. Our aspiration is that we will support peaceful empowered surrender to our predicament, where action can arise from an engaged love of humanity and nature, rather than redundant stories of worth and purpose. Within a safely held and gently facilitated space, we aim to explore the possibilities for meaning, purpose and joy amidst the climate tragedy, whilst cultivating the practice of welcoming the whole range of human emotions, including those that are painful and usually pushed away. The focus is on inner adaptation rather than policies for reducing the harm from societal collapse. The retreat is part of a wider movement on Deep Adaptation. Our hope is you leave better able to host future gatherings on this agenda, and feel more peaceful in your ability to be alongside and support others in their own journeys. 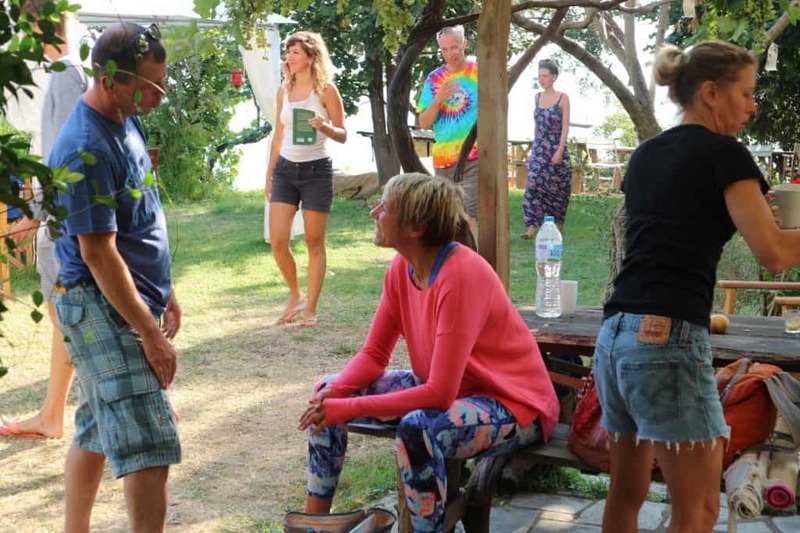 The retreat is hosted within an intentional community which lives lightly and beautifully on the verdant green and blue shores of the Aegean. The food is mostly locally sourced, all home-cooked and vegetarian. A stunningly wild beach is a 20-minute walk away, while old villages are nearby through forests. We can only host 10 participants at the centre, so early booking is essential. You are invited to bring a reading, practice or insight to share that is helping you to explore living lovingly and actively in the face of climate-induced collapse. Katie has hosted and facilitated collaborative learning processes for 15 years, within formal education settings, with communities, and within organisations, most of which can be summed up as “exploring what it means to be human and alive together”. She brings to this work a love of people, and heaps of gratitude and respect for the privilege of being alongside others, and of learning together to become increasingly lovingly aware of the dynamic relational space between us where connection happens. Professor Jem Bendell is the originator of the concept of Deep Adaptation to near term societal collapse due to climate chaos. Five years ago, Jem began offering transformational professional development courses after 20 years pursuing a variety of methods for social change. From anti-globalisation activism and sustainability consulting in the late 1990s, via senior management in large environmental organisations and research roles with the United Nations. Jem’s approach to education is participative, experiential and focused on the whole person. He now dedicates his time to helping people, and himself, evolve in response to the latest climate science. Include the workshops plus full accommodation with 3 daily vegetarian meals (except for one evening out in a Taverna) in a tent €520, a triple room €570, a twin room €670 and a single room €820. All rooms are en suite with sea views and/or balcony. 10:45am – 11:30am Participants share a resource (text, art, other) or personal story, with discussion. 2:30pm – 6:00pm Free time for individual or shared reflection (beach, forest, villages). 9:15pm – 10:30pm Optional evening activities (some activities such as Ecstatic Dance are organised at nearby centres). On one of the days the morning session will involve a walk. The flow of the daily sessions above is indicative; actual activities will be woven organically from the programme above in response to the emergent needs and wishes of the group. In the spirit of collaboration and community-building, you will be asked to contribute about 4 – 6 hours/week to some center tasks like food preparation or joining the washing up team. VISIT THE CENTRE WEBSITE FOR MORE INFORMATION AND TO APPLY TO ATTEND. This year I have often been talking with people about the likelihood of near-term societal collapse, brought on by disruptive climate change. One reason for publishing my paper on Deep Adaptation was to invite such conversations and begin to explore more purposely what the heck this means for my own work and life. Once people move beyond the various barriers to generative dialogue on this topic, we then begin to discuss all kinds of ideas. I’ve found that people are responding in a variety of different ways. But one theme seems to be consistent – people feel nonplussed about how to explore what to do and who to talk to. People feel isolated. That can lead them back into denial. To help me understand my own options and to help others to do the same, I have attempted to map out some of the responses I am witnessing once people accepting near-term societal collapse. What follows is my first attempt at some categories. For each response I have at least one person in mind, but to keep it short, I won’t the give proper examples in this post. I am not a psychologist, and rather than attempt a hack of psychological theories here, I just present these responses in layman’s terms. I have labelled them for ease of discussion in comments below (and for levity). The responses aren’t mutually exclusive – many people are responding in a number of these ways all at the same time, myself included. Reading and talking much more about societal collapse, and all the issues it brings up, but without significantly changing behaviour. That can include being active on social media so your tweets and Facebook posts seem rather doom-laden. Let’s call this “SOS!” response. Changing jobs, moving home, and starting to build a more self-sufficient good life, partly off-grid, usually in the countryside. Or researching and planning this process, actively. I’ll call that the “survivalist” response. In some cases, this response could be a form of denial, as it is going to be so difficult to isolate oneself to cope with collapse, as I have discussed elsewhere. Seeking personal growth via therapy, and/or various forms of meaningful play, time in nature, spirituality, or deep conversations. Many people have expressed a massive personal transformation as they accept near term mortality and lose some of their deference to societal norms and expectations. Let’s call this a “transcendence” response. Talking about societal collapse in one’s professional circles, to explore what could be done within one’s profession and beyond. I am now witnessing a few such attempts, and rather than walking away from own profession, decided to do the same, for now. Let’s call this the “professional sunk costs” response. Taking more risks in one’s workplace and community, to express one’s views with less fear of repercussion. Often this involves speaking about purpose and values and not accepting the dominant assumptions about growth, profit and conformity. The “not hiding anymore” response. Reducing workload to create more time for exploring the issue of climate chaos or societal collapse, in anticipation of making a major decision about changing one’s life. The “taking a breather” response. Retraining to develop skills that may be relevant for being useful to oneself and others post-collapse. That could be learning first aid, horticulture, herbal medicines, musical instruments, or even learning how to use a crossbow. Though that last one doesn’t sound too gentle, as these things are done as much as pastimes as preparations, I’ll call this the “gentle prepper” response. Seeking to repair or improve one’s close relationships, while smelling the flowers and being nicer to pets, neighbours and colleagues. The “palliative love” response. Seeking to know how to deal better with confusion, fear, and anticipatory grief, for oneself and to help others with those emotions. The “emotional self-care” response. Looking for networks of people who are creating self-reliant ‘Arks’, in order to support them and have the option to join later. The “all options open” response. Deciding that the options to change one’s life and work aren’t attractive or practical now, so continuing as normal but with a greater focus on peace and joy while waiting for the collapse. This is the “keep a cyanide pill” response. Though, to be honest, I haven’t met anyone who has prepared that way…. or they haven’t told me. A related response to that one is where people accept collapse, go through the range of emotions, consider a range of options and then consciously choose to try and live in denial to have a happier life for as long as they can. Sometimes this can include attempts at living the dolce vita, spending more on today that they might have, given the bleak outlook. This is the “return me to the matrix” response. Sci-fi nerds might call it the “blue pill” response. Organising to get the idea that we face a climate emergency and should prepare for collapse, such as through preparing for food rationing, on to the political agenda. As it evokes the belief in national government and citizen sacrifice that we have seen during wars, I will call this the “war footing” response. I should note that people who respond in this way have a variety of views that are shaped by their existing politics and values and there is no consensus nor likely to be one. Organising to campaign for geoengineering and/or carbon sequestration while we still have the capacity to act on these. Examples include Arctic cloud brightening, agroecology and kelp planting. Some call for these actions with the idea that while civilisation exists then we have the chance to reduce the speed of climate change and thus give the species a chance to avoid extinction. I’ll call it the “where’s Bruce Willis” response. Turning to non-violent direct action to force changes in practices that are making matters worse. Most instances of such direct action appear to be within a carbon emissions reduction paradigm, but could be influenced now by an awareness of impending collapse. That would bring into view a range of new things to disrupt, depending on the values one holds dear after accepting collapse. I will call this the “climate peace activist” response. Organising to promote a particular set of proposals, and develop certain capabilities, for how to adapt to the coming changes, in particular at local levels. Some have started focusing on practical grassroots initiatives to develop capabilities for deep adaptation. I’ll call this the “humanitarian” response. Organising to promote the cultural concepts that will help us to find and express meaning after societal-collapse. It involves looking for beauty and meaning in a new context. This is one focus of the Dark Mountain group. It’s a “reframing collapse” response. Evangelising about one’s views on life, the cosmos and human organisation. That evangelising can be religious, new age spirituality or a view on politics and social organisation. This response can be cloaked in stories about how becoming a believer, or more devout, will help reduce the harm of climate change (so that gets close to collapse-denial) or help with whatever form of human community may survive. Secular versions include people saying they are developing the blueprint for how humanity will be in future if everyone listens and does what they will be told. Collectively, I’ll call these the “follow me” response. One of the joys of lumping all these approaches into the same category is it will annoy the hell out of the people who respond in this way. Sorry guys, and yes its nearly always guys, but the common denominator seems to be an ego-driven need to hold the truth and be recognised for that. Watching Guy McPherson videos on Youtube. The “masochist” response. Sharing Guy McPherson videos with your Facebook friends. The “sadomasochist” response. OK, that’s an in-joke. “Doomer humour” will be a fast-growing genre. And, by its own admission, fairly fast-ending. Anger and anxiety turning into depression, sometimes leading to suicide. I have read about a couple of suicides related to anxiety caused by awareness of climate change. These were famous cases, so I don’t know of how widespread climate-influenced depression has become. It’s the “depressive” response. Mentioning these responses makes me realise that we need psychologists and others who provide counsel to people, such as coaches and religious leaders, to engage actively in this field and develop the relevant support. Having listed the range of responses above, what does it make you think about or feel? Does it make you ask any questions? Might it help in any way? Please take some time to reflect on those questions, perhaps by returning to them after you finish reading this post. By listing the range of responses, I have begun to see some of the weaknesses in my own responses. I have begun to wonder if what I think is an informed “response” is actually just another form of denial. I am left wondering what my response might become. And what kind of response from other people do I welcome and want to associate with. And what responses I think we should actively help people to avoid. Summarising all these responses also makes me wonder where and how we may begin to find a shared agenda and identity, so that we can begin to learn from each other, coordinate better and sustain our simple human need to belong. That is one area where it would be useful to have more conversations, online and in person. They could include a discussion on what it is we share as principles and priorities as we face collapse. In my own reflections, I have not been drawn to the survivalist or prepper response, which seems to be fear-based and maintains an illusion that it is possible to calculate and control one’s future, through one’s own individual power, amidst future turmoil. Also, it is based on a view that it is good to survive a bit longer than your neighbour when collapse occurs. For me, that is open to debate, as the values and behaviours we believe in have always been as relevant as how long we last on this Earth. I have met many more people who believe an imminent societal collapse invites personal and collective transformation with universal love at the core, than I have met people who become grim survivalists. “Preppers” have a label for themselves. What might be ours? I have wondered whether “collapsnik” could work. It invokes the term “peacenik” from the early 1970s, which described people who campaigned against the West’s war in Vietnam and Cambodia to an extent that it became a cultural identity for them. Similar to peaceniks, we are not apathetic, but principled, devout, counter-cultural and communitarian. Some wonder whether “collapsnik” implies we want collapse to happen. Not in my case – I like my life at the moment. But I could do with a simple way of identifying people who believe collapse is coming and have let that awareness change their lives. The starting point for a generative discussion of the deep adaptation agenda is a difficult one. Because to begin to rigorously and imaginatively discuss this topic first requires us to accept the likelihood of near term societal collapse. By which I mean that within ten years, in whatever society we are living in, that we will find ourselves in a situation where our normal means of income, sustenance, security, pleasure, identity and purpose all disappear. As it is impossible to predict the future within complex systems, “ten years” is not my prediction, and I mention it as a device to help focus this discussion without making people run out the room to stock their bunker. Please note that I am not suggesting we have the whole ten years: we might have less than that. Havent a clue about what I am talking about? Then please read my paper on Deep Adaptation. As I have been talking with people about this topic over the past few years, I’ve become aware of the barriers accepting near-term societal collapse and therefore barriers to rigorous and creative thinking and discussion about what we might do about it, personally and collectively. I have also become aware of the barriers I had for a few years to avoid addressing this topic with the seriousness it merits. So before outlining either the analysis of our environmental predicament or the new agenda this opens up, it may be useful to outline some of these barriers to useful dialogue. I do that as part of my invitation for you to either avoid – or momentarily suspend – such responses and adopt a “what if” perspective on societal collapse. Only then can one explore what a deep adaptation agenda might mean for oneself, one’s work and wider society. I am not a psychologist. I presume there is a lot of psychological theory related to what I am perceiving when I discuss climate-induced collapse. Some theories like confirmation bias, wilful blindness, cognitive dissonance and the relatability of new information are ones that have reached me via the mainstream. But rather than attempt a poor hack of psychological theory to validate or explain my perceptions, I will instead share a purely layman’s perspective of the attitudes and responses I have encountered. I will therefore leave it to psychologists to come to my aid in elaborating on these experiences. In the following discussion, I may also be exhibiting certain fallacies that psychologists could point out for me. Any feedback is welcome (in the comments below). For ease of future discussion, I will label each of the following twelve types of dialogue-barring response with a somewhat catchy title. The first response that is a barrier to discussing deep adaptation is an “ad hominem” response, where we question the credibility of the person sharing the analysis. It is a response we all have when confronted with uncommon views. Is he credible? Is he an expert? Is this view widely shared? These are obvious and important questions to ask. But should not mean you avoid looking at the evidence yourself. Therefore, when asked that question, I suggest people read the summary of climate science and current measurements, in the first part of my Deep Adaptation paper. The second response that is a barrier to generative dialogue on this topic is to label the analysis of collapse as just one type of analysis amongst many. This approach sometimes includes expressing how apocalyptic thinking is a cultural trope throughout human history. This means that one can feel one has a broader perspective of a range of different views held by different people and organisations. Therefore, the emotional charge of the analysis of near-term collapse is reduced. One’s worldview is maintained including the view that one is a reasonable balanced person operating sensibly within a reasonable balanced society. The problem with this perspective is you are choosing to “sit on the fence” on the most important matter in your lifetime. The third response that is a barrier to generative dialogue is to renegotiate for yourself what I am saying. It’s a polite conflict-avoiding form of response. It is where you might choose to focus on what you think is the useable bit of what I’m saying, where you conclude that things are very bad and therefore we need to increase our efforts to stave off collapse. But that’s not what I’m saying. I’m saying societal collapse is now inevitable within, probably, the next ten years. And I’m using the concept of “inevitable” because even if there is a eureka technology right now that is deployed at scale to take carbon out of the atmosphere, the heating that’s pre-determined from existing atmospheric CO2 plus the escalating feedback loops means societies will collapse anyway. The fourth response that is a barrier to generative dialogue on this topic is what I will call the “moral superiority” response. It is when people ask “is he being irresponsible for expressing this view?” The supposition made, most often without evidence, is that it will make people panic or become apathetic, and therefore we shouldn’t even be discussing it. Yet silencing our own thinking and discussion because of speculation on what this might do in the wider world is an illogical way of thinking. It is a response that I examine in my Deep Adaptation paper and contrast with the evidence from worldwide opinion surveys that suggests more people are becoming doubtful about the future. This objection often comes with accusations that people like me are “giving up” and irresponsibly implying everyone should “give up.” That is often said rhetorically without specificity of what exactly we are giving up on. Therefore, such statements reflect an annoyance a person is experiencing when hearing the idea of collapse. I am suggesting people give up efforts at the incremental reform of existing systems. I am suggesting people give up on any dependence on the status and security associated with their current way of life. I am suggesting people give up on assuming their lives have meaning by contributing to progress. I am suggesting people give up in postponing their attention to their own mortality and the meaning of life. I am not suggesting we give up on carbon reductions or active engagement in society. Quite the opposite. Many things can be discussed, as a result of this switch in thinking. The fifth response that is a barrier to generative dialogue on this topic involves thinking to oneself that it might be true, but to know for sure then I’d have to really study and think, and I am too busy right now so will aim to analyse this later. Being busy is comprised of so many things. We could be having so much fun, or having invested so much of our time, money and spirit into a project that hasn’t yet succeeded, or know we want to have the fun we haven’t had before looking at this topic more. Why? Because we sense that looking more closely at near term societal collapse risks disrupting everything think about ourselves, the world and all that we have worked towards. The problem is that while one postpones, a subconscious panic can set in as more information about our current situation passes across our screens. Yes, I speak from experience on that one! A sixth response that is a barrier to generative dialogue on deep adaptation arises from a belief that we create the reality we experience, so we can help avoid a collapse by imagining something else. Within an individualistic framing, there is positive psychology, whether the moderate kind that involves believing ‘where the attention goes so energy flows’, or the extreme kind, where people want to believe in their own cosmic power to manifest anything they want by focusing their desire. Such a view ignores how we co-create our reality with other people and the more-than-human world. It stores up greater pain for when things don’t work out according to ones hopes and dreams. It might also restrict people from applying their minds to the world as it is now. A different version of this “fairy-tale” response to the latest climate science is the idea that so long as we identify with a new story of reality, beyond separation, we will be able to overcome a climate catastrophe. Although our current climate predicament is the result of a warped story of reality and place within it, the idea that by identifying with a new story of interbeing that we can reshape the world around us to avoid a collapse seems like wishful thinking. It may also be seeking to justify a view on reality and metaphysics by arguing for the utility of that view to an individual self – a highly seductive trap for spiritual teachers and their followers. The seventh response that is a barrier to generative dialogue, is to think that because this analysis means it’s too late to fix things and maintain society as we know it, therefore we “may as well” just forget about climate change and do something else. In my experience, this view is shared by people who were not actively participating in society beyond their own self-interest. They may have accepted socially-defined notions of success and seek to avoid pain and maximise superficial pleasures. Therefore, they were not likely to contribute much to dialogues on social change in any case. So, we could let them go on their way. But sometimes I hear people express this view because they are angry at the injustice and inequality in our societies and could welcome how collapse will punish elites. When I hear that, then there is an opportunity to channel that anger at injustice into something more useful, given that it is the poor and marginalised who may suffer the worst in early stage of collapse. An eighth response is to take on board the view that we face inevitable near-term collapse and decide one can’t live with the emotions this causes, so set it aside and work on something else, as if it didn’t exist. That is understandable, but impossible. I know, as this is how I responded for a few years. As more and more information is shared about the state of our climate and impacts on our agriculture and societies, the unresolved emotions lurk ready to interrupt your work and life. A ninth response that is a barrier to generative dialogue is to say yeah, I know we screwed, and that’s OK as our true nature is eternal spirit and therefore the end of society, civilisation, even our species, is just the normal passing of things. Such a perspective means you might say let’s take a deep breath in together and chant Om, then go get a green juice or glass of red wine. Another form of this response that is more likely in cultures shaped by Abrahamic religions (Christianity, Islam, Judaism, Bahai) is that whatever is going to happen to our species is God’s will, and therefore we don’t need to discuss what to do about it. The tenth response I have experienced over the years is to take the analysis of collapse on board and then let the fear-response shape one’s priorities and decisions, so begin to look for means of self-preservation. Many people with that kind of response think they are fully accepting the situation and integrating it into their lives. But being a “prepper” in the complex system of human society within the wider complex system of nature means that this kind of “bunker mentality” is unlikely to work. Not that we shouldn’t look to create arks. An eleventh response to generative dialogue on deep adaptation is the view that near term human extinction is inevitable or very likely. Some people with such a view consider any discussion about what to do to reduce the impact of collapse, save the species, or support what might come after this civilisation is gone, are all forms of deluded hope. That one thinks human extinction is inevitable would not necessarily preclude working on the things I just mentioned, as one can act as if it might still be possible to achieve such things, just in case that it is. Or, it might even be possible to accept human extinction and seek to reduce the radioactive legacy we would leave the rest of planet Earth. Those who dismiss any such dialogue are therefore likely trying to find solace in certainty, rather than reconsider everything and consider being active in society. Rather than deal with the gravity of the analysis, the twelfth barrier is to focus on a detail of communication. For instance, a mistake in a piece of data, or a reference, or annoyance at the tone or content of once utterance. Or perhaps focusing on the lack of depth of discussion in one paper on one set of ideas – from permaculture to geoengineering – which are seen as the be all and end of what should be discussed. This is milder than an ad hominin attack, but helps someone engage with the material without engaging with the significance of the material and thus avoiding meaningful dialogue on deep adaptation. I left it to last in my list as this response is such a boring one, I find it draining to even mention. If people avoid or overcome the twelve barriers I have described, to then discuss the components and implications of a deep adaptation agenda, or similar, then this doesn’t mean people will agree with each other. Not at all. Someone may turn to religion. Some to nationalism. Some to principles of universal love and compassion. Some may focus on geoengineering. Others on humanitarian action. Some on moving beyond capitalism. And so on. But that’s where our dialogues should be focused on now. Sadly, our dumbed-down establishment-aligned media still think it is best to debate whether climate change is real or associated with extreme weather events that, by repeating regularly, show how climate has changed. In future I will write more about some avenues for discussion, for those who want to seek meaning, potency and urgency within a context of impending collapse. But my conviction is that once people overcome the twelve barriers I have just described, then hopefully many better views on what to do than my own will begin to emerge. 5000 downloads within a week and over 100 emails in my inbox, the release of my study on climate collapse and deep adaptation generated more attention than I had anticipated. It was written about in New York Magazine and Counter Punch. And even in Pakistan. The biblical weather the northern hemisphere has been experiencing during the summer of 2018 may have focused minds on climate change. I released the study as an Occasional Paper with my Institute in order to “fly a kite” and see who might respond. That was because I wanted to discover who is working on this issue, to then discuss more as I explore what I might do in future. Already these new interactions are showing me the appetite people have to actively develop this agenda. It is more evidence that an understanding we face a social collapse due to climate change can lead to personal reflection, grieving, transformation and new grounds for action, rather than despair and apathy. What do you mean by social collapse? What should government do for deep adaptation? What should I do in my community for deep adaptation? Are you counter-productively implying we should give up trying to fight climate change? Is your stance the same as the “survivalist” or “doomer” perspective? Are there spiritual implications to your perspective? Are you a credible and ethical person? What should I do to explore this topic further? By the term “social collapse” I mean to imply an uneven ending of normal modes of sustenance, security, pleasure, identity, meaning, and hope. For some people these needs may be met in new ways. I say “social” or “societal” rather than economic or environmental, as these uneven endings will pervade society, and challenge our place within it. For instance, being a Professor won’t be much use anymore. But being myself might be. Some say collapse has already begun and can point to the role of the unprecedented drought in Syria since 2010 in destabilising rural communities and creating conditions for extremism, war, and refugees. Others point to the growth in rebellious attitudes amongst electorates as indicating a widespread subconscious recognition that normal is over. But if we are talking about social collapse as I have defined it, and in the Western hemisphere, which is of interest to most who ask the question of when, then obviously that is not happening yet. How long it will take is impossible to say in complex systems. Given the impacts on food shortages, a few more Northern Hemisphere summers like this year and the return of a strong El Nino in Asia, could trigger social collapse in some countries, if we don’t respond at such a time with bold and imaginative compassion. It’s difficult to process these ideas without a clear idea on when. So, I have sought to reconcile myself with the idea that I will see social collapse happening in the West in less than 10 years. That’s not a prediction and I hope that’s wrong. I hope we manage to delay things by massive changes in policies and behaviours. And by seeding Arctic clouds, immediately. But, as a thought experiment, as someone in their mid-40s, I am now exploring what a 10-year life expectancy makes me prioritize in life. And when I meet who wish to discuss this topic, I recommend they do the same. For parents of young children that can be particularly difficult. But denial or despair won’t help them. I am not an expert in any area of emergency response. And I am new to the idea that we face a social collapse. But I have some initial thoughts, which relate to the idea of resilience. First a collapse in agriculture means governments will need to prepare for how to ration food. That could mean livestock farmers that use grains having to close and our diets looking very different. It is unlikely normal free markets will work in that context. The way our financial markets will respond to the realisation of climate shocks is unpredictable and the risk is that our systems of both credit and payments could seize up. That means governments need to ensure we have electronic means of payment outside of the private banking system, so trade can continue if there is a financial collapse. Then there are things that will take a bit longer. For instance, building desalinisation plants will be key across Europe. The things I just mentioned are not in any of the national adaptation reports that I have read, which indicates how expecting social collapse invites a different level of conversation and preparation. There will be the psychological challenge of how to help people who experience dread, grief and confusion. Many of us may be deeply affected by a loss of the assumption of progress or stability. How do we plan our lives now? That will pose huge communications challenges, if we want to enable compassionate and collaborative responses from each other as much as possible. There is a role for leadership on that – and perhaps from leaders in government. Of course, we should try to buy some more time. We should be seeding and brightening the clouds above the Arctic immediately, as a global emergency, similar to how we would react if an extinction-sized meteor was hurtling towards Earth. The network of professionals and activists using the term “post-growth” are discussing some useful ideas about policies and have had longer than I to consider implications. Given that we see such poor leadership in most national governments and a poverty of resources in local governments, there is also an equally important agenda for communities. In the UK the deep adaptation framing has been used over the past 12 months to shape community discussions, supported by a Christian charity. In my own work I see global efforts at restoring local community in a material sense to be key and have been volunteering accordingly. I explain the importance of that work here. Others who are being influenced by an acceptance of a near term collapse are also looking to local resilience. Some participants in Joe Brewer’s discussions on managing planetary collapse, in Dark Mountain dialogues and in some Transition Towns initiatives also share this view. No. A number of things can be true at the same time. We should be clear that climate change poses an existential threat and no longer make cuts in carbon emissions a secondary concern. I still believe in a global carbon tax framework, applied upstream at energy generation and distribution, and embedded into international trade law to have teeth. We also need to sequester carbon via changing agricultural systems, replenishing soils, growing sea weed, restoring sea grass meadows and reforestation. We should also invest massively in artificial means of carbon sequestration. Although most forms of geo-engineering will be too risky and potentially counter-productive, the seeding and brightening of clouds above the Arctic and Antarctica is essential to experiment with immediately at scale. We should also continue the range of activities included in a narrow interpretation of adaptation. I am just calling for a broader agenda on that. I have noticed that some people engage in this discussion with a need not just to be right but to be more “right” than others, where their particularly approach is the best and therefore the only one worth considering. Such psychological patterns result from fear, insecurity and outrage at the situation we face. So, they are understandable. But must not affect our decision making. Is your stance the same as the “survivalist” or “prepper” perspective? There is a similar starting point: it is time to accept a social collapse is coming. But the discussion I’m inviting is about collective responses to reduce harm, rather than how a few people could tough it out to survive longer than others. I appreciate that prepper or survivalist responses to anticipating collapse will spread. I don’t think it will work at their goal of guaranteeing comparative longevity, given the unpredictability of the complex systems we live within. My own experience is indicative. In June, with a group of friends we toured around some eco-projects, where people have made a choice to live off the land, to varying degrees. One of those places was near Rafina, which was at the epicentre of the tragic fires in Greece just a month later. You may think you have thought of all eventualities and will have – until you haven’t. We can and should look to live more resiliently and closer to the land that feeds us, but there are no guarantees that this will help. I also think survivalism can be a form of denial: by getting busy rather than allowing oneself to process and integrate a nearer sense of the mortality of oneself and those we love. The likelihood of climate-induced collapse invites us to make time in our lives, right now, for existential and spiritual questions. That can then help us whatever choices we make on how to approach the future. Are there spiritual implications from your perspective? Yes. This year I have given myself more time to study and discuss fundamental questions about the universe, reality and the self. I have participated in a range of practices that are novel to me and focus on reconnection with self, nature and each other. These include meditation, breathwork, authentic relating, yoga, peak states, and nature walks. I am currently sceptical of what established religious institutions or promoters of self-help spiritualities are offering people that can help them comprehend our predicament. But I am fairly new to that topic and see there is much that spiritual communities could do in future. I put together some advice on these personal dimensions to our predicament, based on my own experience, and include them at the end of this post. Not many academics have concluded publicly that we face an inevitable near-term social collapse. Most natural scientists would avoid using the word “inevitable” for anything due to their attention to methodology. Even the most frightening of studies from natural scientists, such as the new one on “Hothouse Earth” reserve judgement on saying what will happen or that collapse is inevitable. In my paper I lay out the scientific studies and current measurements which lead me to the conclusion we face a near term collapse. About a dozen academics have got in touch to welcome my paper and say they have reached the same conclusion. I need to ask them all whether they wish to be public about that before then sharing on my blog. Some wonder if I am challenging the quality of the peer review process of the journal I submitted the paper to. I am not. I think the journal editor and reviewers did their job properly. The feedback from the reviewers was helpful for clarifying to me that my conclusions in effect reject the whole premise of the subject area, and so that it is time for me to move on. The editor believed in my past work, and therefore asked me to resubmit with “major revisions.” The actual recommendations of the reviewers were withheld from me. I presumed, therefore, because one had said “reject” and the editor wanted instead to give me a chance to try again. I wrote to the editor saying that “major revisions” were not possible given the critique and requested changes which went to the core of the argument and were effectively asking for a different paper. I am waiting for confirmation of that situation from the publisher, as they would like me to state I withdrew the paper, rather than it being rejected. My view is that it was not accepted, one reviewer probably rejected it, the editor overruled that to give me another chance, but the changes requested would have amounted to a new paper with a different argument, so I withdrew from the process. I will update on that if I hear different information from the publisher on the reviewers’ actual recommended decisions. After receiving the reviewer comments, I took some weeks to reflect on the options. I decided the situation is too grave to delay sharing my analysis and I wanted to invite conversation about what we should do. To be so public on this matter renders some of my past knowledge, experience, status and networks now redundant. It also risks opprobrium or ridicule. So, some deep breathing, long walks and sharing circles were helpful as I made the decision. Try talking about it with some people who are open-minded and open-hearted. We don’t need many people to be conversation partners for exploring things. For networks, I recommend the following the Deep Adaptation group on LinkedIn which I established for professionals. Other info I list here. To keep up to date with an unvarnished assessment of the latest climate measurements, I recommend the regular youtube postings of Paul Beckwith, who is completing his PhD at Ottawa University. Below are some insights from my own struggles with this information. How I arrived at these insights is covered in my (rather long) reflection on my last few years. The following recommendations arise from reflecting on the positive and negative aspects of my past four years since I began to accept the inevitability of near term social collapse. Return to, or explore afresh, the idea of a divine or a spirit or a consciousness or a God that is prior to the Earth and moves through the Universe right now and forever more. Do so without seeking a simple story of explanation but a sense of faith that there is an existence and a meaning beyond our culture, our species and our planet. Such ‘faith’ helps anyone to experience and process the inevitable difficulties and traumas of life. Listen to those stories from people both past and present who tell us that despair is not the end and therefore does not have to be avoided. Recognise how many spiritual traditions see despair as a gateway to our growth. Beware when people are promoting their views on what they think the implications of information will be, rather than views on the information itself. The impacts of certain information about climate on other people’s motivations are not certain, and in many cases the darkest analyses have triggered a new level of creativity and boldness. Instead, look at the information and analysis directly for yourself, without second guessing what some interpretations might lead to. Recognize that any emotional or intellectual resistance you may experience to information which implies catastrophe may come from what you have been consciously or subconsciously telling yourself about your own self-worth, purpose and meaning. Then remember how your views of yourself and the world have evolved through your life and still can. Don’t panic. Give yourself time to evolve both personally and professionally in response to your emerging awareness, but ensure you stay connected to a group or an activity which keeps reminding you of the basis for your emerging awareness. Recognize there is much work ahead for you to reconstitute concepts of meaning and what’s good and to align your life with those. It will not happen overnight, yet it will not happen if you do not give time to this work. There may be some time needed to bridge your existing life with the way you will want to live in future. Plan more time and resources for you to do things which inspire wonder at life. This could be more time in beautiful environments, or with uplifting music, or in contemplation, or through creative writing, or being with loved ones and close friends. That means freeing up time from other activities such as TV, social media and mainstream news. It may also mean downshifting from your workload. Look for opportunities for supported self-reflection and sense-making. This is because your worldview and self-identity will undoubtedly transform overtime as you process the new information and analysis. Expect a catharsis, both personal and professional. This will occur because the subconscious or conscious limits that you placed on yourself until now will be lifted. Go with that rush of energy and creativity, but be vigilant that those new activities don’t become so consuming they distract you from the personal work you still need to do. If you are a mission-driven professional in fields related to environment or social justice then expect that you may be driven to rebuild a sense of self-worth and that this need of the ego, while natural and potentially useful, could become a frantic distraction. Expect a change in your personal relationships and how you spend your spare time. Some forms of small talk and light-hearted social interaction with acquaintances may seem pointless, while you may wish to spend more time with close friends and family. While for some this could be a welcome rebalancing, for others this can become a vector of reclusiveness and loneliness. Therefore, it is important to find new ways of connecting with people on the new levels that feel meaningful to you. Create a positive vision of people sharing compassion, love and play. It may feel that an eco-tragic outlook means you cannot have any meaningful vision of a better future for yourself, your community, or humanity. An absence of something positive to work towards can be destabilising and limiting. Some people will think you are depressed – or depressing – and need some “positive thinking”. For a personal vision, the answer may lie in developing a vision for how you will be approaching life, rather than imagining attributes of a lifestyle. This may parallel the dimensions of a collective vision. A future full of love and learning, rather than flying cars and fancy robots, could be a way to imagine a more beautiful world. And remember, the future will still be beautiful in its own way, no matter what life forms are in it – or if your favourite town is under water! Don’t get dogmatic and avoid those who do. That comes from recognising that our terms for phenomena are not the same as the phenomena themselves. The words we use imply things which may have effects on us but aren’t necessarily so. Words like near-term, civilisation, collapse, and tragedy, are our words, and may trigger ideas, images and emotions which aren’t inevitable consequences of the phenomena being described. Do not prioritise maintaining your own mental and physical situation at the expense of the need to act in solidarity with future generations who will live with the future we are creating for them. Tomorrow’s children won’t thank us much for having joined a support group on Facebook or taken up yoga, unless it aligned with us remaining active in the world. The paper “Deep Adaptation: A Map for Navigating Climate Tragedy” is downloadable in pdf format, or as a podcast. If you have come to recognise that climate change will lead to a near term collapse in our way of life, or even worse, then this can be a very difficult realisation to process, integrate into our lives, or communicate to other people. In my experience, the key thing is not to sit with these emotions on your own. If you have people who you can talk to about this without them thinking you must be confused, insane or depressed, then that’s ideal. However, many people feel very lonely in their realisation. Therefore, here are some links to resources that I have found helpful, as they enable you to get in touch with others. The Aching Heart Movement is a Facebook Group associated with Extinction Rebellion, and holds regular online ‘grief circles’, facilitated by experienced grief workers. These circles have been warmly recommended to me by friends. Death Cafe movement is an umbrella movement providing support and resources for local face to face community death cafes. You can find out if there’s a cafe near you, or even start one. This movement is not overtly about climate grief, but the meetings are absolutely open to anyone, and anything that they might bring. The Positive Deep Adaptation Facebook Group. This one focuses on sharing ideas and information on how to live well after acceptance of likely (or unfolding) societal collapse. You won’t see posts saying we can stop a catastrophe nor on how bad things are getting, but ideas on how people and organisations are responding positively… Even if that just means how to reduce suffering. This one is my initiative and connected with the Deep Adaptation Forum (see below). The Human Near Term Extinction Support Group on Facebook. I have not concluded that we are going extinct but the people on this group offer useful support to people struggling with that possibility in their awareness. There is also a similar group, same topic but mentioning love in the title, and I’m not sure what the difference is. The Deep Adaptation LinkedIn group is more of a professional focus, and less sharing of resources and support for emotional processing, but still offers the possibilities of connecting with others who are considering the implications for their own lives of climate crisis. The Deep Adaptation Forum, launched in March 2019, will be a place for deeper engagement and collaboration. Again, this platform is aimed at different professional perspectives. The Reframing Collapse Facebook Group also can provide helpful feedback. Video casts by Deb Ozarko and her book Beyond Hope. Roy Scranton’s book Learning to Die in the Anthropocene and another book of the similar title, reviewed here. I write up some of my own reflections on how I have been trying and wobbling to integrate this awareness into my life and work, in this rather long reflective piece called “After Despair.” I also explored some of the emotional aspects of this topic in an hour long interview here. Ultimately, I think we will best supported by activities that support our transcendence from our normal fears, whether those activities are spiritual or agnostic. There are an increasing number of spiritual coaches appearing online such as my friend Zori. These forms of grassroots, diverse, non dogmatic, spiritual inspiration and support will become more important. If you have suggestions, please enter them in the comments below. If you want to attend events to discuss these issues with people, then you could follow this blog (link on the right) and you will get updates on what I post here, which include retreats like this one in UK. If you are still thinking whether it is wise to further explore your acceptance of this predicament, perhaps because of ideas it might be irresponsible or counter-productive to think we can’t prevent a breakdown in our society, then I recommend reading my post on forms of collapse-denial. My academic paper on the latest climate science as well as the many forms of denial about our situation is available for download here.